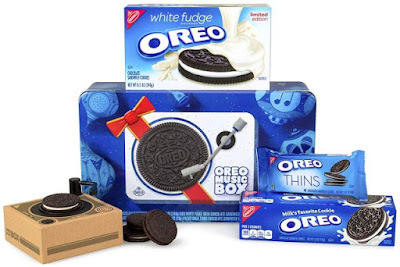 For those looking for an interesting gift for the Oreo fan in their lives, the brand is offering the Oreo Music Box this holiday season at Amazon.com. The mini Music Box turntable plays a variety of Oreo-themed songs when you place an Oreo cookie on it. If you take a bite out of a cookie and place it on the turntable, a different song is played. Additionally, you can record a personal message or song to play when the Music Box is activated. The Oreo Music Box comes in a collectible holiday gift tin that also includes a 1.02-oz package of regular Oreo Thins, a 5.2-oz package of regular Oreos, and an 8.5-oz package of White Fudge Oreos. The price tag on the Oreo Music Box gift set at Amazon.com is $19.99. While the Oreo Music Box is new to us in the States, it was originally introduced in China last year.